Okay the following polishes are some of my favorite this year (and the year is almost over). If you haven't already seen Mariah Carey's 2013 Winter Holiday Collection for OPI go see it NOW at HB Beauty Bar. They have it available for purchase! 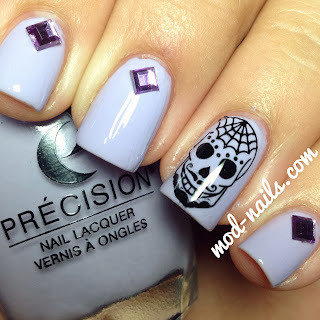 And if you haven't heard of Precision Nail Lacquer you need to grab a few to add to your nail polish collection. 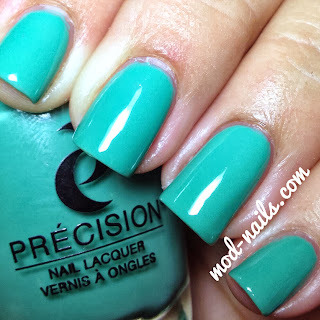 Precision Nail Lacquer is a 3 free nail polish and the color are beauuutiful. Look #1 is Precision Nail Lacquer's "Pink With A Wink" and my thumb is OPI's "Ski Slope Sweetie" topped with OPI's "I Snow You Love Me" Glitter Top Coat which is so unique and beautiful. I used three coats of "Pink With A Wink" topped with Seche Vite. It's a little shimmery and easy to apply. I love this pink. A girl can never have too many pink polishes. Look #2 is a beautiful teal polish. It's called "McDreamy" from Precision Nail Lacquer. Yes, as in McDreamy for Grey's Anatomy and I couldn't love the name more. This was two coats topped with Seche Vite. I love this color. Look #3 is Precision Nail Lacquer's "Walking On Air." It's a beautiful lilac polisha and I wish my photo looked more of what the color looks like. It's not as gray in real life and it's a really pretty shade of purple. I stamped it using Bundle Monster's stamping plate BM413 from their new collection and rhinestones someone got me from Japan. Make sure to grab your Precision Nail Lacquers and the new OPI Mariah Carey Winter Holiday Collection from HB Beauty Bar!